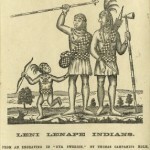 The Seneca tribe was one of six that formed the Iroquois League. 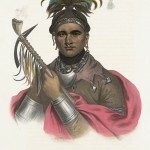 Seneca war chief Cornplanter, shown here in an 1836 color lithograph by J.T. Bowen, based on a 1796 painting by F. G. Bertoli, fought in both the Seven Years' War (also known as the French and Indian War) and the American Revolution, and later served as a diplomat with the United States. 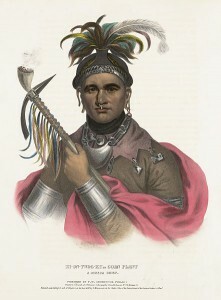 Cornplanter was one of the signatories on the 1784 Treaty of Fort Stanwix, which ceded huge tracts of northwestern Pennsylvania to the United States. In reward for his service, the United States granted Cornplanter a tract of about 1,500 acres in northwestern Pennsylvania in 1796. The land was to forever remain in possession of the Seneca tribe. It was the final Indian settlement in Pennsylvania. Despite over 150 years of occupation, in 1965 the residents of Cornplanter's Town were forced to relocate to the Allegany Reservation in New York when the Kinzua Dam was constructed and the land was flooded. 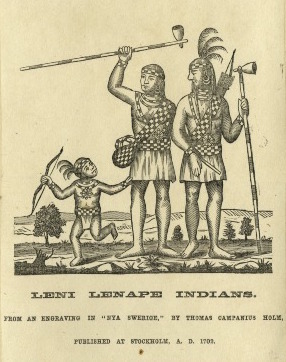 Members of the Delaware tribe, also known as the Lenape, are depicted in this 1702 engraving by Thomas C. Holm. They historically occupied the Delaware River basin from southern New York to southern Delaware along the Atlantic coast, and west along the Schuylkill River into central Pennsylvania. The Delawares were stripped of a large portion of their homelands by the Walking Purchase in 1737 and many were forced to migrate farther west. The Delaware people formed new homelands by combining with other displaced tribes such as the Shawnees and Senecas. A series of land deals between the Iroquois and the colonists further stripped the Delaware of their lands and forced them out of the state. Delaware diplomat Teedyuscung, in an attempt to secure land near Wilkes-Barre for his tribe, negotiated the Treaty of Easton with the British in 1758, but the American Revolution nullified the treaty. The Delaware were forced out of Pennsylvania and often died in defense of their homeland. By the early twenty-first century, the Delaware tribe numbered some 16,000 members. The majority of these people live in Oklahoma after centuries of forced western migration. Two small tribes of Delaware remain in New Jersey. Between 1736 and 1792, the Iroquois League, formed of the Seneca, Oneida, Mohawk, Cayuga, Tuscarora, and Onondaga tribes, made several important land deals with American colonists, often without the consent of those tribes who occupied the land. This map shows the land cessions made by the Iroquois from 1736 to 1792, spanning from Lake Michigan in the west to the Atlantic Ocean. In western Pennsylvania, the Iroquois ceded significant tracts of land to the Penn family and Connecticut's Susquehannah Company in 1754. They later aided Virginia land speculators in obtaining the “Ohio country” in central Pennsylvania, where many Delaware Indians migrated as European settlers encroached on their historic homelands. In 1768, they negotiated the Treaty of Fort Stanwix, selling large swaths of Delaware and Shawnee land in central Pennsylvania without the approval of those tribes. By the end of the 1790s, the Delaware and Shawnee had been effectively forced out of Pennsylvania. The Iroquois League continues to this day, with over 120,000 enrolled members. In 1763, a confederation of Indian tribes in the Great Lakes area conspired to attack the British forces occupying their land in the wake of the French and Indian War. The panic generated by this event caused a violent backlash in Pennsylvania. This image shows the Paxton Boys, a Scots-Irish vigilante group that attacked the Conestoga tribe at the Conestoga Indian Village in Lancaster County under the pretense that the tribe was harboring spies. Despite the Conestogas having been historically friendly to the settlers, the Paxton Boys murdered all twenty residents of the village in two attacks. After first losing six members within the village to violent ends on December 14, the fourteen remaining Conestogas fled to Lancaster where they were secured in the county jail for their safety. The Paxton Boys continued to pursue the Conestogas and on December 27 the remaining members of the village were murdered in the jailhouse. In January 1764, the Paxton Boys marched to Philadelphia, where they threatened violence against Pennsylvania's remaining Indian tribes in the Moravian Missions. Further violence was avoided as Benjamin Franklin and other city leaders intervened against the Paxton Boys. This 1841 image by William Sinclair shows the brutal massacre of the Conestogas by the Paxton Boys. 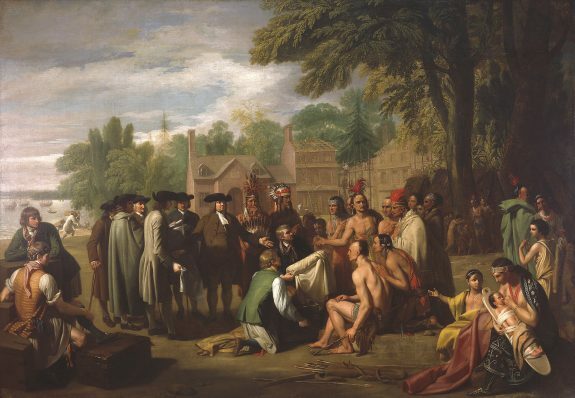 This painting, Penn’s Treaty with the Indians, by Benjamin West (1738-1820), depicts the legendary meeting of William Penn with Lenape Indians in which they agreed to coexist peacefully, as West imagined it. By 1754, European colonization had substantially altered the location and number of Native Americans in Pennsylvania. The Delawares (also known as Lenapes) had been mostly dispossessed from the river valley that was their original homeland. Despite being stripped of their claim to the Lehigh Valley by the Walking Purchase (1737), some Delawares still lived in that region in Moravian missions while others remained in small towns in central and southern New Jersey. Many Delawares had migrated into the Susquehanna Valley and the Ohio-Allegheny region, which was called the “Ohio country” by colonists. Elsewhere, Indians from the northern Chesapeake Bay and North Carolina migrated into the Susquehanna Valley in the early eighteenth century. By the 1740s, two Indian towns with polyglot populations had become important centers in Pennsylvania’s Indian relations: Conestoga in Lancaster County and Shamokin, at the juncture of the north and west branches of the Susquehanna (modern Sunbury). Farther west, Delawares who settled in the Ohio country were joined there by Shawnees and Senecas who were also drawn to the region by its bountiful resources. Thus, on the eve of the Seven Years’ War, Pennsylvania’s native population included a number of groups that had already experienced the consequences of colonization. By moving into the Susquehanna and Ohio regions, where they amalgamated with each other, these groups established new homelands and new alliances to defend them. In 1754, the Natives’ claim to these homelands came under attack from several directions. Agents acting on behalf of the Penn family and Connecticut’s Susquehannah Company completed land purchases with the Iroquois Indians of New York who ceded significant portions of western Pennsylvania without any approval from the Indians who lived there. Virginian land speculators raced against the Penn family to lay claim to the Ohio country, again relying on cooperative Iroquois from New York. At the same time, the French asserted their possession of the region by building forts between Lake Erie and the Ohio River. After a British army commanded by General Edward Braddock was defeated by a French and Indian force at the Monongahela River in July 1755, war engulfed the Pennsylvania frontier. Delawares and Shawnees supplied by the French at Fort Duquesne (modern Pittsburgh) raided frontier communities in a broad arc from northwestern New Jersey through the Lehigh Valley to the Juniata River, taking captives, destroying livestock, and killing poorly defended settlers. 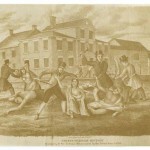 Pennsylvania’s government responded by instituting scalp bounties that encouraged indiscriminate reprisals against any Indians within the colony’s borders. A Delaware Indian named Teedyuscung (1700?-1763) emerged as an important intercultural diplomat at a series of treaty conferences convened in Easton, Pennsylvania, between 1755 and 1758. Teedyuscung claimed to represent ten Indian nations, but his chief objective was securing the Delawares’ possession of the Wyoming Valley, along the northern branch of the Susquehanna River (near modern Wilkes-Barre). In negotiations with the Pennsylvanians and other British colonial officials, he asserted the Pennsylvania Indians’ independence from the Iroquois. In this effort, he was supported by Philadelphia Quakers who sought to restore peace by exposing the fraudulent land purchases William Penn’s heirs had made with the Iroquois. Although neither Teedyuscung nor the Quakers succeeded entirely in their mission, the Easton Treaty of 1758 did end Pennsylvania’s Indian war by restoring some of the disputed territory and by promising that the British would evacuate the Ohio country after the French had been defeated. An uneasy peace returned to Pennsylvania after 1758, but the war had permanently altered relations there between native and European peoples. 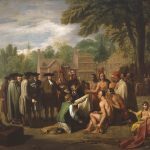 Pennsylvania colonists, despite their ethnic and cultural differences, came to see themselves as sharing a common, racially-defined “white” identity in contrast to the Indians’ “savage” one. In the Ohio country, a Delaware prophet named Neolin (fl. 1760) preached a doctrine of “separate paths,” urging Indians to revive ancient customs and spurn Christianity, alcohol, and other aspects of colonial culture he held responsible for corrupting the native way of life. This revivalist message fueled a pan-Indian resistance to the soldiers and settlers who began moving into the Ohio and Susquehanna regions after 1758. In 1763, renewed hostilities sparked by military occupation and land-grabbing broke out in western Pennsylvania. Pontiac’s War (1763-65) plunged the Pennsylvania frontier into another wave of violence, including an Indian siege at Fort Pitt (the British post built on the site of the old Fort Duquesne), during which British officers discussed using smallpox as a biological weapon against the enemy. In Lancaster County, a group of colonial vigilantes known as the Paxton Boys murdered the Native population of Conestoga Indian Town, which had been allied with the Pennsylvania government since 1701. The Paxton Boys then marched on Philadelphia, threatening to kill Indians from the Moravian missions who had sought refuge there, but intervention by Benjamin Franklin (1706-90) and other city leaders prevented further violence. By 1765, a decade of warfare had altered the power dynamic in Pennsylvania’s Indian relations. Quakers no longer exerted moral or political authority in the colony’s Indian policy. Instead, frontier settlers assumed all Indians were hostile and tacitly condoned their exile or murder. Speculators from within and outside the colony competed against each other for Indian land, paying little heed to the retrocessions that natives had negotiated at Easton in 1758. At the Fort Stanwix Treaty of 1768, the British Crown’s Indian agent Sir William Johnson (1715-74) conducted yet another land sale with the Iroquois that ceded Delaware and Shawnee homelands without their consent. The American Revolution accelerated Indian dispossession in Pennsylvania. Freed from the restraints of British imperial authority, the Americans attacked and uprooted Native populations. A Continental Army expedition in 1779 laid waste to Indian towns in the northern Susquehanna and Allegheny Valleys. 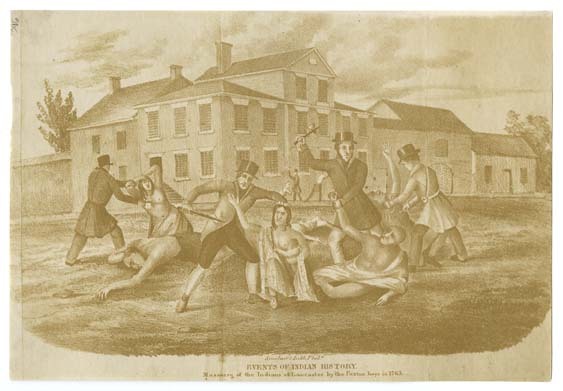 In March 1782, militiamen from the Pittsburgh area murdered nearly 100 Delaware men, women, and children in the Moravian mission town of Gnadenhütten in the Ohio country. By the war’s end, nearly every Indian community within Pennsylvania’s borders had either been destroyed or abandoned and their survivors forced to seek refuge in Ohio or New York. The state of Pennsylvania recognized no federal or state Indian reservations within its borders. By the 1790s, only one small Indian community remained within Pennsylvania: a group of Seneca Indians who lived along the Allegheny River on land privately owned by their leader, Cornplanter (c. 1750-1836). Cornplanter’s Town remained on this property until its inhabitants were forced to relocate onto Seneca reservation lands in New York by the construction of the Kinzua Dam in the 1960s. Despite the fact that Indians and colonists alike often invoked the memory of William Penn in their treaty negotiations, the Quaker founder’s vision of a peaceable kingdom in Pennsylvania never came to fruition. The Penn family’s hunger for Indian land contributed to this deterioration in relations, but other causes included the militarization of Pennsylvania’s frontier after 1754, the unstoppable stream of settlers who invaded Indian territory, and the intrusion of imperial officials and land speculators from other colonies into Pennsylvania’s Indian affairs. Most importantly, after 1754 the mosaic of ethnic identities within Pennsylvania hardened into two separate and diametrically opposed racial categories: white and Indian. Europeans pursued policies that denied natives membership in the Pennsylvania commonwealth, while natives trying to survive the onslaught of colonization decided that their best option was to move beyond the reach of their European neighbors. Jennings, Francis. Empire of Fortune: Crowns, Colonies, and Tribes in the Seven Years War in America. New York: W.W. Norton, 1988. Kenny, Kevin. Peaceable Kingdom Lost: The Paxton Boys and the Destruction of William Penn’s Holy Experiment. New York: Oxford University Press, 2009. 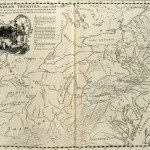 Merrell, James H. Into the American Woods: Negotiators on the Colonial Pennsylvania Frontier. New York: W.W. Norton, 1999. Merritt, Jane T. At the Crossroads: Indians and Empires on a Mid-Atlantic Frontier, 1700-1763. Chapel Hill: University of North Carolina Press, 2003. Preston, David L. The Texture of Contact: European and Indian Settler Communities on the Frontiers of Iroquoia, 1667-1783. Lincoln: University of Nebraska Press, 2009). Richter, Daniel K. Native Americans’ Pennsylvania. University Park: Pennsylvania Historical Association, 2005. Shannon, Timothy J. Iroquois Diplomacy on the Early American Frontier. New York: Viking Penguin, 2008. Silver, Peter. Our Savage Neighbors: How Indian War Transformed Early America. New York: W.W. Norton, 2007. Wallace, Anthony F. C. King of the Delawares: Teedyuscung, 1700-1763. Syracuse: Syracuse University Press, 1990. Boyd, Julian P., ed. 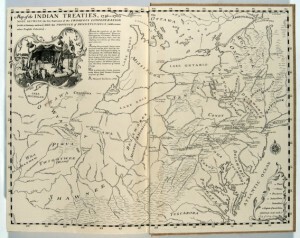 Indian Treaties Printed by Benjamin Franklin, 1736-1762. Philadelphia: Historical Society of Pennsylvania, 1938. Jennings, Francis, et al., eds. 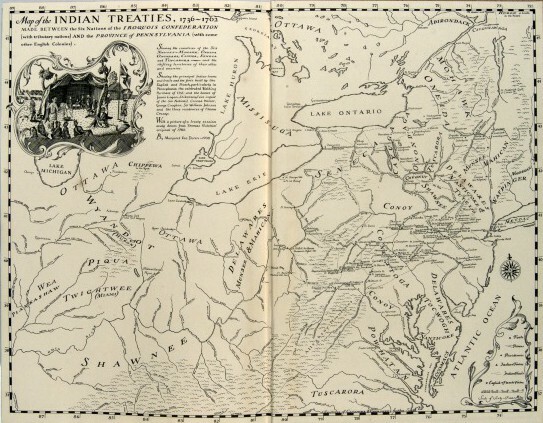 The History and Culture of Iroquois Diplomacy: An Interdisciplinary Guide to the Treaties of the Six Nations and Their League. Syracuse: Syracuse University Press, 1985. Minutes of the Provincial Council of Pennsylvania, 16 volumes. Harrisburg: 1852-53. Bushy Run Battlefield, Jeanette, Pa.
Fort Necessity National Battlefield, Farmington, Pa.
Fort Pitt Museum, Pittsburgh, Pa.